In order to sustain the momentum that Sanders has built for a political revolution, we have to continue to attract new people to the cause, regardless of the outcome of the primary and general elections. Should Sanders win, this will occur naturally as Clinton supporters grudgingly fall in behind him like the faithful party members they are. If he loses and Hillary goes on to win the general election, it will be much more difficult to convince Clintonites to join the effort. They are, after all, pretty much by definition willing to settle for whatever the party can give them. How else could they enthusiastically support someone who represents everything the other half of the party is revolting against? They are also very angry that Sanders continues to use his campaign to criticize the party, which they see as irresponsible since it boosts chances of a Trump victory. As usual, supporters of the Democratic status quo want to blame those who refuse to go along for the results of their complacency. It’s obvious that the division between Sanders supporters and Clinton backers is growing, even while the Democratic establishment is demanding that the party come together to prevent a Trump presidency. Clinton supporters are alarmed and angry that Bernie’s legions do not bow down defeated, or at least be grateful for a symbolic place at the table in July. After all, they would line up behind Sanders if he had beaten all odds and prevailed despite the systemic disadvantages he faced. They cannot understand how any Democrat could consider not voting for anyone with a D after her name if it meant keeping a Republican out of the White House. Given this simplistic view of politics, Clintonites conclude that Sanders supporters are just being unreasonable. They attribute the anger they are seeing to youthful naïveté, misogyny, or the fact that Sanders continues to express anger at the Democratic status quo. Only the latter argument has any serious basis, but only a blind partisan would argue that criticizing what the party has become is a bad thing. In fact, their failure to acknowledge the validity of Sanders’ critique is the real source of his supporters’ anger. If Clinton’s advocates cannot be made to understand the central importance of Sanders’ challenge to the corruption of the system, we must look elsewhere to build a movement that continues when the Sanders campaign ends. Should she prevail in November, it may actually be easier to recruit Trump followers to the cause than her supporters. Not being blinded by the corporate media spin on Wall Street’s darling, Trump’s fans may be more amenable than Clinton supporters to the idea of working together on issues on which most Americans agree. 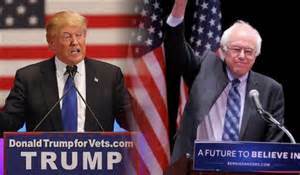 Trump and Sanders supporters already have in common that they both reject the Duopoly leadership. Both are increasingly aware that Duopoly politicians are subservient to interests other than our own. Given the positions Trump has taken, it is clear that his supporters are not as ideological as progressives typically assume Republicans to be. If we can learn to stop thinking in partisan terms, we can find common cause on many issues. In addition to mutual contempt for the Duopoly establishment, there is widespread nonpartisan agreement many critical issues that Trump and Sanders support and on which Clinton’s record is at odds with public opinion. It’s time to abandon the assumption that politics is a battle between fundamentally opposing forces of the right, represented by Republicans, and a left represented by Democrats. This simplistic dichotomy is so deeply engrained in Clinton supporters that they cannot comprehend why Sanders and his supporters are challenging what the Democratic Party has become. Their identification with the party brand is so strong that many question whether an independent progressive like Sanders is a “real Democrat,” but fail to ask themselves how they define the term. They assume that any politician who calls herself one is, regardless of how much her neoliberal and neoconservative record resembles that of a typical Republican. For many such Democrats, the choice is not which candidate best represents them but whether that candidate can prevent the dreaded outcome of a Republican in the White House. They consider themselves on “the left” simply by virtue of party membership. In contrast, Trump supporters do not identify with the Republican Party, even if most are members. Among them are many who might be persuaded to consider the Sanders message, if their candidate does not win and they face four to eight years of Clinton. Sure, some are just attracted by racism and many by his willingness to say whatever foolish thought crosses his mind, but many Trump enthusiasts like some of the good ideas he claims to support. Many of his positions echo those of Sanders: opposing free trade, ending policies of regime change, mandating a living wage, restoring civil liberties, having a more balanced relationship with Israel and most importantly, campaign finance reform. A great many people are impressed by the fact that Trump’s campaign is largely self-funded. True or not, they see this as evidence that he is not beholden to special interests. Those who think these issues are important are people who may be able to understand that “making America great again” has nothing to do with making it whiter and everything to do with ending corruption of government by special interests. The average Trump booster may even be more ready for political revolution than some Sanders supporters. All of them firmly reject the Republican establishment, while many Sanders supporters are ready to vote for Clinton she wins the nomination, despite the fact that she stands for everything Sanders is fighting against. Those of us dedicated to bringing about political revolution know that it begins with challenging the corruption of the system. That starts by refusing to vote for any politician who is the clear choice of the same interests that back both Duopoly parties. Maverick status is another thing that Trump and Sanders share. If we stick to issues and not personalities, there is a chance that we can overcome the suspiciousness that the corporate media and politicians have deliberately created between us and work together toward the common goal of establishing representative government in the US. It is the opposition to being led by politicians who put the interest of the economic elite over those of average Americans that should bind people from across the political spectrum in this common cause. When 80% of Americans have expressed opposition to Citizens United, it seems obvious that we should be able to work together to do something about it. That is exactly what the Sanders revolution is all about. If we want politicians to represent us, we have to stop applying ideological labels to ideas that can lead to solutions to problems that affect us all. “Conservative” and “liberal” should be relative terms, not absolutes. If we don’t allow others define what we are supposed to believe, we can find that consensus necessary for true representative government. If we can make it that far, we can then decide through the democratic process what kind of country we want to be. Those of us on the left know that what Sanders calls a "revolution" is only the first step in the transformation necessary to produce a just society. Some of us labor under the delusion that if we are patient, some day Americans will rise up and overthrow the system that oppresses us. Even more unreasonably, some think this can somehow be done without dirtying our hands in electoral politics. Others argue that it can only be done by building a third party to challenge the corporate Duopoly. While creating an alternative to the Duopoly will play a role in the ultimate transformation of American politics, it will take many years to realize. We simply do not have the luxury of time. The reality is that global climate change sets an upper limit on how long we have to act. Until we begin electing candidates who will stand up to the Wall Street-dominated fossil fuels industry, we are living with a sword hanging over our heads. When "liberal" Americans seem prepared to select the darling of Wall Street to represent them in the presidential election, there is too much groundwork to be done to create a viable third party before it is too late. Clinton's success despite her high unfavorability ratings shows how far we have to go to educate the public about the need for revolution and what that will entail. We must begin with the system as it is, meet the people where they are at, and hope that by speaking to them in their language, we can lead them to question the assumptions that keep them captive of a system designed to favor the interests of the powerful. That means elections matter, even if one victory does not in itself constitute a "revolution." They provide platforms from which to educate and organize those who have not given up altogether on rescuing the US and the world from the dire circumstances we have allowed it to fall into. Sanders has shown how this can be done without depending on the very interests who control the system to get this opportunity. The question remains as to whether the Sanders candidacy will advance the cause of a real revolution, or impede it. If his supporters simply cave in and support Clinton, they will show that they are unwilling to challenge the practice of fear-based “strategic” voting promoted by the Democratic leadership. The grip on power of the party elite depends on successfully convincing us that voting for corporate Democrats is the only alternative to Republican rule. It is not. If their jobs depended on it, these power brokers would have to give us candidates who actually represent the People’s will. If the majority of Democrats continue to accept the lesser of two evils logic, they have no reason to expect that the party’s steady drift to the right will ever end. If they refuse to vote for the anointed candidate of the limousine liberals, we have a chance to force change. A lot of people have been saying since the beginning of the Democratic primary campaign that Sanders would end up doing more harm than good to the cause of fundamentally changing the system of American politics. Assuming that he would lose in the end, they pointed out that his ultimate endorsement of Clinton would serve simply to shore up a party that can no longer generate excitement among even its most faithful members because its chosen candidates are unwilling to challenge the moneyed interests that he is targeting. The naysayer’s argument was that, like past insurgent candidates for the Democratic nomination, he would serve as a sheepherder for the Duopoly party claiming to represent “the People” by encouraging his disappointed supporters to rally round the choice of the Establishment. While this is a distinct possibility, those committed to a real revolution need to understand that we cannot succeed without learning to recognize and capitalize on every opportunity. Whether or not Sanders wins the nomination, his amazing run presents such an opening, one we may not get again. While he can help advance the cause beyond the convention, let’s remember that he has told us endlessly that the outcome of the struggle is in our hands. We have to be prepared to respond to the very real possibility that Sanders himself will abdicate leadership in the movement he has begun, even while encouraging him to stay the course. We have to help him fight for every vote to continue getting his message out during the campaign and at the convention. We must also encourage him to set his sights higher than simply making the case for progressive policies before a convention run by politicians whose primary interest is maintaining power and who believe that can only be done by kowtowing to the corporate elite. Words must be followed by action. Ralph Nader recently argued that if Sanders were to lose at convention, he could still keep his word to endorse Clinton, while challenging her corporate vision. There is nothing to stop him from continuing his assault on neoliberalism and corruption that is the root cause of America’s malaise. While justifying his ongoing efforts as a way to rally his troops to defeat Trump, he can continue to barnstorm in favor of the Democrats. The key is that rather than promoting the failed policies of Clintonism, he can argue for those Democratic values that people want to believe the party represents. This will prepare us for continuing to fight for them if Clinton is elected, rather than abandoning the fight as Obama supporters did after 2008, with predictable results. 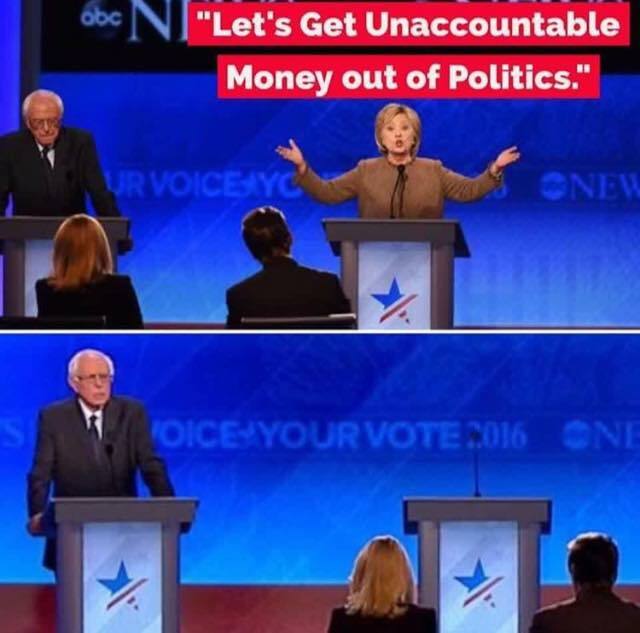 A true political revolution must be based on addressing the corruption upon which the current system is built. Sanders has gotten the ball rolling, focusing our attention on the fact that the entire progressive movement depends on dealing with this problem. With our encouragement, he can keep the movement going forward. Even without his cooperation, we can proceed on our own. He has provided us a glimpse of our collective power. We have to use it, organizing around the issue of corruption and highlighting how the consequences play out in a Clinton presidency, as they no doubt will if her policies are consistent with her atrocious record of neoliberalism, neoconservatism and generally favoring the interests of Wall Street over Main Street. If we can get average Americans to set their sights that high, they might be able to glimpse the more fundamental changes that will be required to reshape the US economy and society into something that will enable future generations to not only survive, but thrive. Okay, I’ll admit it. I have often lost patience with long-time friends support Clinton. I have been impatient and said disrespectful things that I regret. I don’t want to make excuses for my behavior, but in my defense I have to say that it is very frustrating that so few of them seem to be willing to take a look at why “Bernie bros” are so adamant in their support of Sanders. It seems obvious to us that we have an historic opportunity to decisively reject the assumption that a person can only be elected President if they are backed by powerful economic players. How could anyone choose Wall Street’s golden girl over a champion of campaign finance reform and all the progressive battles we will never win until it is achieved? To paraphrase the unofficial motto of the first Clinton’s campaign: “It’s the corruption, stupid! That’s not meant to be personal, of course. It’s just that the seemingly willful blindness of Clinton supporters is maddening to those of us who recognize the need for a real political revolution to end control of the political process by the narrow economic elite she represents. However, the idea that they are willing to stay with a candidate who has done nothing but abuse them and sweet talk them with broken promises should inspire pity, not wrath. Their passion for Clinton may be irrational, but isn’t that the nature of love? It is not helpful to lash out at them for seeing the best in her, even when what they see is not there. That is, after all, a common feature in the battered spouse syndrome. Democrats who support Clinton show all the signs of this depressingly common condition. We Sanders supporters are not helping our case by lashing out at the very people we should be trying to reach. We need to take a deep breath, remember that these are people we care about, and realize that self-destructive behaviors are common in people who have been abused. We may be surprised that they are not acting like the people we thought they were, but these are our friends! We have been through so much with them over the years that we cannot abandon them when they most need understanding. It is no doubt this emotional bond that makes us so angry when we see them debase themselves by asking for more abuse from the Democratic Party. We are only angry at them because we care. Despite a long history of abusive relationships with past Democratic politicians, those who have fallen victim to Clinton’s wiles fail to recognize that the party they have sworn not to forsake is not what they thought it was. Like victims of other forms of abuse, they seem to be attracted to those very characteristics which prevent a healthy relationship. While the dysfunctional nature of the relationship is obvious to those of us who can view the situation objectively, to the star-crossed hopefuls who desperately want to believe that they have found true love, the party can do no wrong. Every time they think they have found someone who understands them and who shares their interests, they find out too late (if ever) that they are understood all too well, and have fallen for another politician who will exploit their weakness for their own purposes. Clinton supporters are often quite intelligent people. Knowing this, their friends have to wonder why they tolerate the abuse they have suffered from the Democratic Party without complaint. The answer isn’t complicated. They are so blinded by the love for the one they are in bed with that they accept any excuse for her actions that allows them to cling to the fantasy that they are cared for. Confronted with bald faced lies, they would rather accept ridiculous excuses than face the truth that the person they have chosen has no respect for them. The fact that a number of these lies are over such trivial matters that they suggest a compulsion doesn’t even seem to cause them concern. Oh sure, such people can be nice. Not to accuse Clinton specifically, but let’s admit it: Everyone knows that psychopaths can be the most charming people in the world. For instance, the fact that she makes a show of supporting the rights of women and children in public doesn’t necessarily mean she is compassionate. If this were a deeply held value, would she not care as much for women and children in Iraq, Ukraine, Libya, Syrian or any nation targeted by her neocon friends? Her capacity for violence is well known, and at times she does not even bother to hide the pleasure it brings her. It doesn’t cost her a thing to say nice things about people to get votes, but those who are taken in are not seeing the glaring inconsistencies in her behavior. I don’t want people to get the idea that I am exaggerating my concerns about my Clinton-loving friends for effect. For the most part, the abuse has been subtle but all the signs are there. Let’s face it: If they haven’t learned from the mistakes they have made in past relationships, they aren’t going to see this one coming. They are likely to deny it when it gets worse, and the suffering she inflicts gets more serious. Just look at how many of them still moon over Bill, after all his transgressions. He wasn’t just a liar and a cheater. He put our finances at risk with NAFTA and banking regulation, destroyed the party’s already shaky reputation for favoring diplomacy over war by introducing “humanitarian intervention” in Kosovo, and did a lot of other disgraceful things that Clintonites have forgiven or forgotten, if they were ever acknowledged. Although she now repudiates her support of her husband’s crime bills, opposition to gay marriage, welfare “reforms” and claims to have never supported NAFTA, Hillary is on record as having promoted all of it. She is also opposed to reinstating an updated version of Glass-Steagall that Bill eliminated, obfuscating the issue by pretending that Sanders doesn’t understand the role of the shadow finance industry. Doubling down on her claim to have opposed NAFTA from the beginning instead of only during the 2008 campaign, she now wants us to trust her claim that she opposes the TPP, which she played a key role in negotiating. I am trying to be understanding, but like many Americans, I am dismayed at the fact that anyone who considers herself a progressive would choose a business-as-usual “pragmatist” like Clinton over someone with a long record of supporting real solutions to the problems threatening the US middle class. Anyone who looks at the record of past failed relationships with Democratic politicians objectively can see the problem is in falling in love with the false image they present to us, even when all the clues are there. We don’t have to “settle.” We deserve better. Despite our past mistakes in choosing who to trust, we do not deserve to be treated this way. The only reason anyone accepts this is that they don’t want to face the shame of being played for a fool. The truth is that most of us have been there at some point in our lives. We need to let those stuck in this mental prison know they are not alone. It is not being “realistic” to accept that they cannot do better. Now that we actually have a choice, we need to take it. Let’s recognize that ever since Bill strayed off on the Third Way, Democrats have lost their sense of identity. They must find the will to deal with the endemic corruption of electoral politics that the Democratic establishment has embraced. At the risk of idealizing Sanders as “Mr. Right,” the choice seems clear.